At Businesshelp, we are certified Xero installation consultants. Working with our clients, we can provide you with a complete accounting solution. Xero is the most user friendly system we looked at and this is why we now implement it into so many of our clients businesses as it has immediate efficiency gains at absolute minimal cost. Xero is a cloud-based accounting package and is open source. This means it is a system that easily integrates with other systems you might have but also means there is access to an incredible range of ‘add-on’ applications. The end result being a fully integrated financial and operational package that will meet your needs at an amazing price. The installation is quick and easy, we can get you up and running in no time. Access your business finances anytime, from any internet-connected device – phone, tablet, or computer. Know how you’re doing financially with daily updates from your bank accounts and credit cards. Invite your advisor to collaborate with you on your business in real-time. And give your staff access to the areas they need to do their job. Easily create and send invoices with online payments and invoice reminders for quicker payments. Xero backs up your data and protects it with multiple layers of security including industry-standard data encryption and secure data centres. 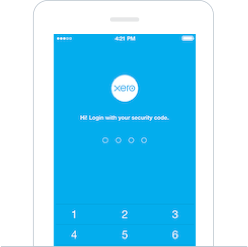 We also offer two-step authentication as an additional layer of protection for your Xero account. If you need help, you can choose to let the support team view your data and provide the advice you need on using Xero. And online guides, videos, and FAQs are available to help you get moving.